Poll: Are you satisfied with the building designs? And make sure you're using 1.6.4 with Forge installed. Don't bother posting a 1.7.2/10 report. Again, decompiling mods, makes bugs. Meaning, I won't fix them. I'm sorry for causing them, but I can't do anything to help you. Do you think I would just, magically update to 1.7 whenever you demand it? That just makes me want to not even consider updating to 1.7. Lesson to all of you. Demanding for an update, is not allowed, nor is it tolerated by a mod developer. We do this stuff for fun, and in our free-time. Meaning, we could be doing other great stuff, not programming Minecraft mods. Be grateful for what you get. i was not demanding i was simply asking but in different words and i just really want to play it on 1.7.2 because that is my version of my mod pack i dont download much from my mod pack. Geez, is it me, or is there immense lag for when the Reficules attack? When they do, my framerate absolutely plummets. What the heck's going on? Could you update it to 1.7 or 1.6? CAN SOMEONE HELP ME?!?! when im pressing "y" nad i click start its just stuck and do nothing. what i need to do to fix that?!?! Step one: Don't be an idiot. Step two: Download the mod and put it in your mods folder. 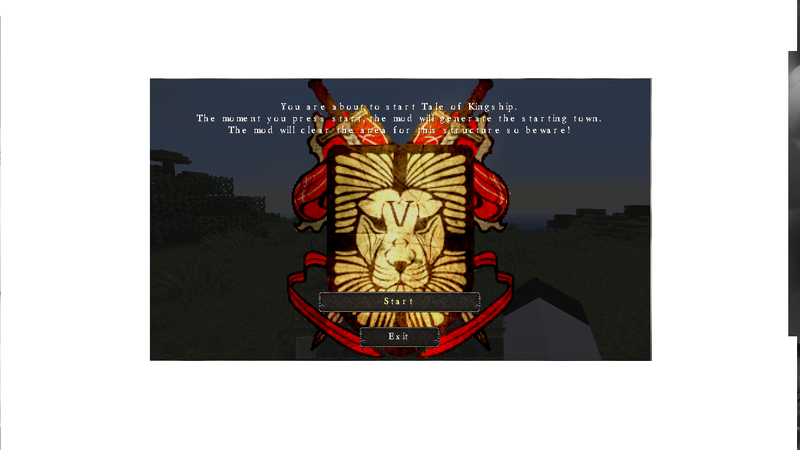 Step three: Open the zip file (the mod file) and extract the folder " TaleOfKingship " to the mods folder (Same directory). Step four: Load Minecraft, load a new world, and let it crash. Step five: Load that world up again, and it will not crash. If you have anymore questions, please ask away. Dude, click the big Download(Adfly) button. <-- Click here to help me grow my dragon! Should I consider this mod dead? It hasn't been updated in over a year. When will you update the mod? I can't get it installed I'm installing these mods in 1.7.10 and i don't know if I need to put a zip folder or just a normal folder in the mods folder with all the other mods I had a jar file or for some a regular folder. Can someone please help me with this? I would love it! Because I want to mainly play this mod and use the others to spice things up and stuff. Man I wonder what happened for us not to get an update in a year. I wonder why this mod is dead (And yes I know the mod creator has a life and maybe had trouble our somewhat) but when you do come back can you please update this mod to 1.7.10 or the latest version of the time you come back (like idk 1.9 or 2.0 lol) But please update this mod. Its really good and has potental but if you cannot keep it updated give the mod coding to someone else who can keep the mod updated.